The view was stunning. Breakfast (on demand) by the pool was outstanding. Very helpful and friendly staff/ very quiet location/ very clean and modern facilities---gorgeous infinity pool for relaxation. Management staff answered all questions after making the reservation---no unpleasant surprises. View was breathtaking (standard Santorini). The pool was great and the room was relatively spacious. Everything was extraordinary. Simply amazing. The Georgia at the front desk was friendly and very helpful. Thank you Amaris with the bags. Would have never made it up those steps without you. The location was perfect! The views were insanely beautiful from the pool area and our own private porch. We had our own hot tub and breakfast was served every day there. It was fresh and at our convenience. We loved it! The staff were beyond helpful. Georgia, Marco and Adriana made sure every person felt special from arrival to departure. Ariadne was the woman I communicated with before we arrived and she was wonderful. She also greeted us at check in. She offered to arrange a transfer from the airport, and I am so glad we did. 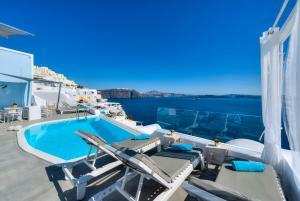 The property is a terrific location in Oia- out of the fray but still very, very convenient. The service was excellent. The rooms were awesome! The pool was very nice. Great hotel for the iconic cave room/hotel experience! it was the most inexpensive we could find with all the luxuries except for the private plunge pool. Has an amazing view. Great location on the main strip, well kept, pool looks better than on the pictures. Room is spacious and has nice linens. Breakfast was great and was served in front of our room with the views. Friendly staff. Kima Villa was absolutely incredible! 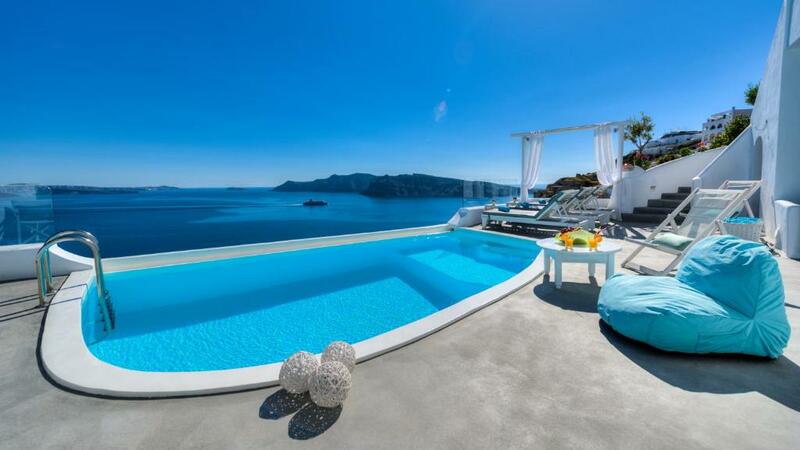 I knew it would be gorgeous, it is in Santorini after all, but this place is picture perfect. My husband and I wanted to get away and relax. There are only 8 villas, so it was private, quiet, and the staff are so friendly and attentive. We walked to all the restaurants, art galleries, and gelato shops! It was the best vacation we've ever had. We'll be back! 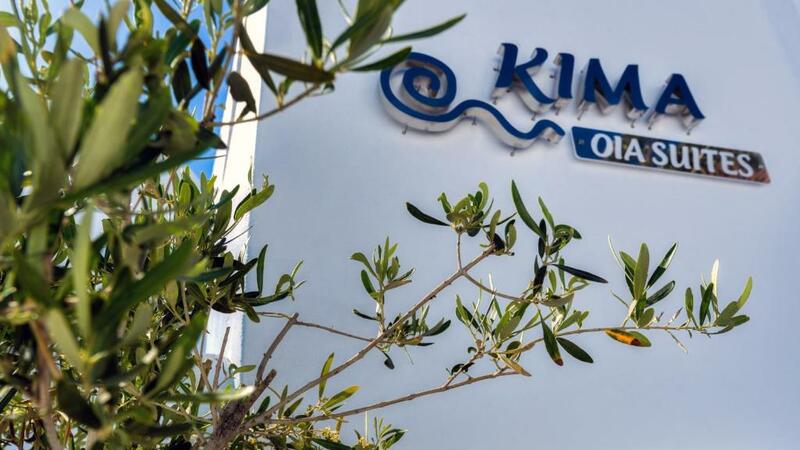 Lock in a great price for Kima Villas Suites – rated 9.6 by recent guests! One of our best sellers in Oia! 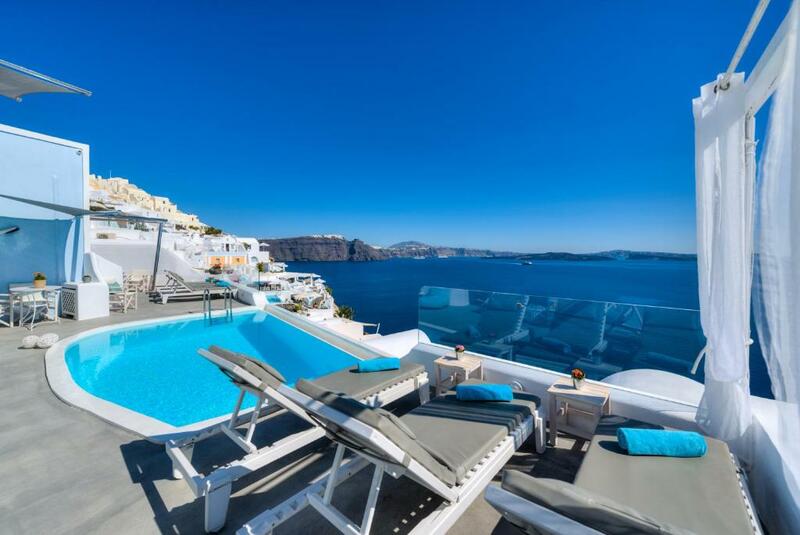 Swimming in the outdoor pool and enjoying the view of the volcano is just another day at Kima Villas Suites in Oia. All suites have a private balcony and free Wi-Fi. Kima Villas Suites offers units with air conditioning, satellite TV and seating area. The balconies look out over the Caldera and the volcano. A satellite TV is also available. 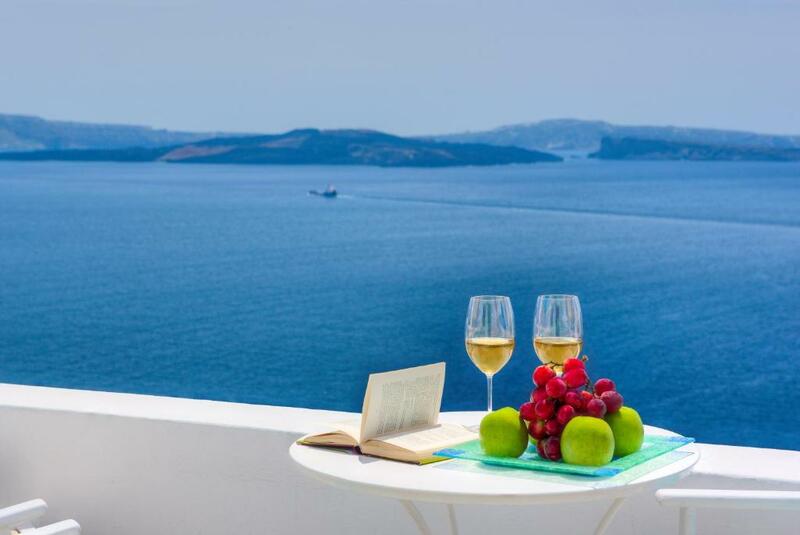 Guests can start their day with a continental breakfast served at comfort of their balcony, while enjoying the view. When would you like to stay at Kima Villas Suites? Suite with spacious bedroom, traditional bed and orthopedic COCO MAT mattress. It has a private balcony with tub with hydromassage facilities and view to the caldera, the volcano and the sea, where breakfast is served daily. It is also equipped with a flat-screen satellite TV, air conditioning, safe box, free WiFi, free tea and coffee daily, and mini-bar. 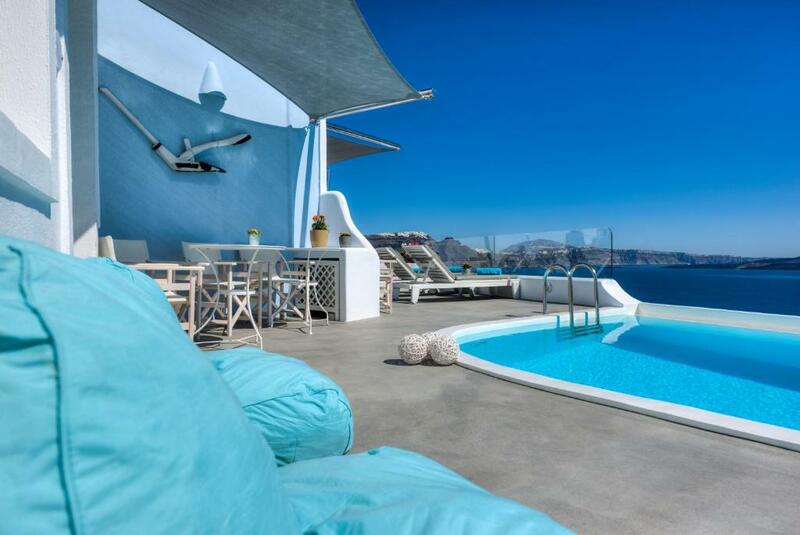 Cave-like suite with vaulted ceilings and a balcony with tub with hydromassage facilities and view to the caldera, the volcano and the Aegean Sea. It is also equipped with a flat-screen satellite TV, air conditioning, safe, free WiFi and mini-bar. Orthopedic COCO MAT mattresses are included. Please note that breakfast is served daily in the balcony, while free tea and coffee are also provided daily. Opening to a balcony with caldera, volcano and pool views, this room includes free WiFi, a flat-screen TV, a mini-bar and a bathroom with amenities and bathrobes. Opening to a balcony with caldera, volcano and pool views, this suite includes free WiFi, a flat-screen TV, a mini-bar and a bathroom with amenities and bathrobes. Το Κima Villas Suites απέχει 12χλμ. απο το κέντρο των Φηρών και 15χλμ. απο το λιμάνι του Αθινιού και το αεροδρόμιο της Σαντορίνης. Η ρεσεψίον προσφέρει πληροφορίες και βοήθεια γα ενοικίαση αυτοκινήτων, εκδρομές με σκάφη και κρατήσεις στα καλύτερα εστιατόρια του νησιού. Σε απόσταση 20 μέτρων βρίσκεται η στάση του λεωφορείου απο την οποία περνάει το λεωφορείο που συνδέει την Οία με τα Φηρά και απο εκεί σε όλους τους υπόλοιπους προορισμούςστο νησί.Η στάση βρίσκεται ακριβώς δίπλα στην εκκλησία του Αγίου Γεωργίου.Στην γύρω περιοχή στεγάζονται καταστήματα ρούχων, τουριστικών ειδών, καθως και κοσμημάτων, εστιατόρια, παραδοσιακός φούρνος και καφέ μπαρ Σε απόσταση 50 μέτρων απο το ξενοδοχείο υπάρχει ιδιωτικό πάρκινγκ με χρέωση. House Rules Kima Villas Suites takes special requests – add in the next step! Kima Villas Suites accepts these cards and reserves the right to temporarily hold an amount prior to arrival. We had a great time at Kima Villa Suites. It is well located, 5min away from the centre but in a quiet part of Oia. The view was amazing and the team super welcoming. They gave us good advice and were very accomodating. Kima is extremaly well located. The room is cozy and romantic. Breakfast is served in front of the room with a wonderful view of the Caldeira . Adriana, one of the staff is great! She gave us the best indications, helped us booking restaurants, sailing cruises and made our stay just perfect. They are all very friendly. Great View and the Double Deluxe Room was very comfortable and larger than expected. Great place to stay! Everything was just as we expected based on the photos (which is unfortunately not always the case) and even better. The location is perfect with great privacy and amazing views. Some similar hotels in the area have much busier location and people passing by the balconies and terraces. One of my favorite things every day was to have the breakfast at our balcony looking at the caldera and enjoying a slow morning. The staff was so nice! Everyone was professional yet relaxed and friendly. Transportations were arranged very promptly and smoothly, and also the restaurant recommendations received on arrival were good. no major or even minor suggestions---lots of attention to detail already in place at this small boutique hotel. We loved the amazing veiw! The room was spacious and cool a temperature always. The daily breakfast was delicious and served whenever we wanted with great friendly service. The pool was also amazing! It was the final stop of our honeymoon and what a treat! Located right in picture perfect, postcard material Oia. We were welcomed with a cava bottle and got to enjoy every single moment we spent there. The room was very, very comfortable, spacious and clean, with view to the caldera from inside. The terrace and pool are wonderful to enjoy the maginificent view. It is a small hotel, so it feels great to spend time there. We left happy. Every single part of our stay was amazing. We were blown away from the minute we arrived. Friendly attentive wonderful staff. Gorgeous breakfast with the most amazing views.